DIE Jovis, 15o Novembris, 1739. His Majesty, being seated on the Throne, adorned with His Crown and Regal Ornaments, and attended with His Officers of State; the Prince of Wales (in his Robes) sitting in his Place on His Majesty's Right Hand; the Lords being also in their Robes; commanded the Gentleman Usher of the Black Rod to let the Commons know, "It is His Majesty's Pleasure, that they attend Him immediately, in this House." "The present Posture of Affairs has obliged Me to call you together, at this Time, sooner than has been usual of late Years, that I may have the immediate Advice and Assistance of My Parliament, at this critical and important Conjuncture. I have, in all My Proceedings with the Court of Spain, acted agreeably to the Sense of both Houses of Parliament; and therefore I can make no Doubt but I shall meet with a ready and vigorous Support in this just and necessary War, which the repeated Injuries and Violences committed by that Nation upon the Navigation and Commerce of these Kingdoms, and their Obstinacy and notorious Violation of the most solemn Engagements, have rendered unavoidable. "I have augmented My Forces by Sea and Land, pursuant to the Power given Me by Parliament; which I have done with all the Moderation that the Security and Defence of My Dominions, the Protection of our Trade, and the necessary Means of distressing and annoying our Enemies in the most sensible Parts, would admit: But, as these Services will be various and extensive, they must inevitably be attended with great Expences and some Inconveniencies; which, I assure Myself, will be sustained with Satisfaction and Chearfulness, in pursuing such Measures as the Honour and Interest of My Crown and Kingdoms, and the general Resentment of an injured and provoked Nation, have called upon Me to undertake. "I have ordered the proper Officers to lay before you Estimates for the Service of the ensuing Year; and likewise Accompts of the extraordinary Expences that have been made this Year, in Pursuance of the Power given Me by Parliament. And as, in the Prosecution of this War, a Number of Soldiers to serve on board the Fleet may be requisite, I have judged it proper that a Body of Marines should be raised, and have directed the Estimates for this Purpose to be likewise prepared and laid before you: And I cannot doubt, from your known Affection to My Person and Government, and your Zeal for the Safety, Prosperity, and Glory, of these Kingdoms, but you will grant Me such effectual Supplies, and with such Dispatch, as may forward and give Spirit to our Preparations, and enable Me to carry on the War with Vigour. "The Heats and Animosities, which, with the greatest Industry, have been fomented throughout the Kingdom, have, I am afraid, been One of the chief Encouragements to the Court of Spain, to hold such a Conduct towards us, as to make it necessary to have Recourse to Arms; and the unhappy Divisions amongst My Subjects are the only Hopes of the Enemies to My Government. But whatever Views and Projects they may form upon this Rupture, and what Advantages soever Spain may vainly promise itself from any Circumstances in the present Situation of Affairs; it is in your Power, by the Blessing of God, to defeat the one, and disappoint the other. Union amongst all those who have nothing at Heart but the true Interest of Great Britain, and a becoming Zeal in the Defence of My Kingdoms, and in Support of the common Cause of our Country, with as general a Concurrence in carrying on the War as there has appeared for engaging in it, will make the Court of Spain repent the Wrongs they have done us; and convince those who mean the Subversion of the present Establishment, that this Nation is determined, and able, both to vindicate their injured Honour, and to defend themselves against all our open and secret Enemies, both at Home and Abroad." The Speech being ended, His Majesty was pleased to retire; and the Commons returned to their House. Their Lordships, together with James Earl of Morton, having, at the Table, first taken the Oaths, and made and subscribed the Declaration, and also taken and subscribed the Oath of Abjuration, pursuant to the Statutes. Hodie 1a vice lecta est Billa, intituled, "An Act for preventing the Poor's being defrauded." The Lord Chancellor reported His Majesty's Speech. It was proposed, "To resolve, That an humble Address be presented to His Majesty, to return Him the Thanks of this House, for His most Gracious Speech from the Throne. "Thankfully to acknowledge the Regard His Majesty hath expressed for the Sense of both Houses of Parliament, in His Proceedings with Spain; and the Confidence shewn in His People, by desiring to have the Advice and Assistance of Parliament, as early as possible, in this important Conjuncture. "To declare our just Resentment of the injurious and offensive Conduct of the Court of Spain, aggravated by their Violation of the most solemn Engagements, and their Ingratitude for the highest Obligations; and to express our Sense of the Justice and Necessity of the War declared against that Crown. "To assure His Majesty, that we will zealously concur in all such Measures as may forward His Preparations, and enable Him to carry on the War with Vigour. "To acknowledge the gracious Disposition which His Majesty hath expressed for the Ease of His People, by acquainting us, from the Throne, that He has augmented His Forces with all the Moderation that was consistent with the desirable Ends He has pointed out to us; and to declare our firm Persuasion, that whatever shall be necessary for the Prosecution of the War will be chearfully born by His faithful Subjects. "To express our deep Concern, that any Heats and Animosities have been fomented throughout the Kingdom, especially at a Time when the most perfect Union is necessary against the common Enemy, which we shall endeavour to our utmost to promote: And to give His Majesty the strongest Assurances of our firm and unalterable Zeal and Affection for His Sacred Person and Government, and the Protestant Succession in His Royal House." 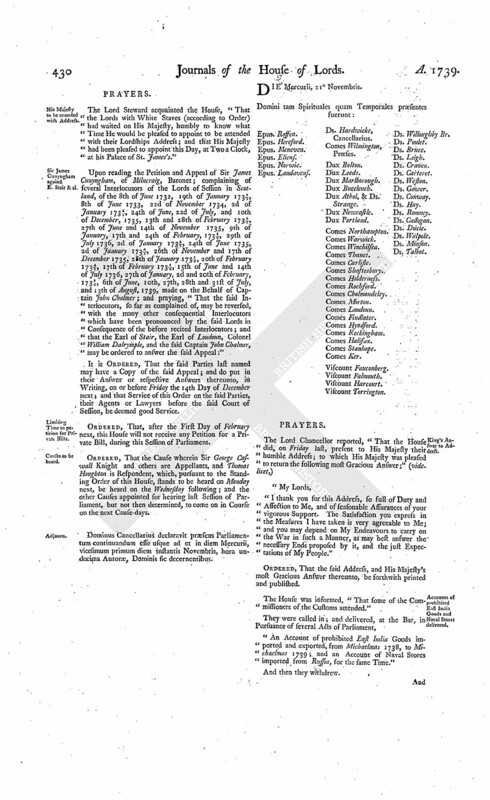 It was moved, "To leave out, in the last Paragraph, these Words, (videlicet,) ["To express our deep Concern, that any such Heats and Animosities have been fomented throughout the Kingdom, especially at a Time when the most perfect Union is necessary against the common Enemy, which we shall endeavour to our utmost to promote"]." The Question was put, "Whether those Words shall stand Part of the Question?" Ordered, That an humble Address be presented to His Majesty, pursuant to the foregoing Proposition. Vis. Fauconberg. L. B. Bangor. L. Delawar. Their Lordships, or any Five of them; to meet presently, in the Prince's Lodgings; and to adjourn as they please. The House was adjourned during Pleasure; and the Committee withdrew, to prepare the Address. And the Lord Poulet reported from the said Committee, "That they had drawn an Address, pursuant to the Direction of the House." "We, Your Majesty's most dutiful and loyal Subjects, the Lords Spiritual and Temporal in Parliament assembled, beg Leave to return Your Majesty our sincere and humble Thanks, for Your most Gracious Speech from the Throne. "The great Regard which Your Majesty hath expressed for the Sense of both Houses of Parliament, in Your Proceedings with the Court of Spain, is a Continuance of that Royal Goodness and Concern for the true Interests of Your People, which we have so often experienced; and Your Majesty's Desire to have the Advice and Assistance of Your Parliament, as early as possible, in this important Conjuncture, is a fresh Proof of Your real Confidence in Your faithful Subjects. "The Justice and Necessity of the War, which Your Majesty has been pleased to declare against Spain, must be as demonstrable to all the World, as the violent and intolerable Methods practised by that Nation to interrupt and distress the Navigation and Commerce of these Kingdoms are notorious: And it is the highest Aggravation of this offensive and inexcusable Conduct, that it has been obstinately pursued, in Breach of the most solemn Engagements, and in Defiance of the highest Obligations of Friendship and good Offices. But, since Great Britain has been thus unavoidably called forth to Arms, we esteem it our peculiar Felicity that we have a Prince upon the Throne, who, with Paternal Tenderness, joins in the just Resentment of an injured Nation, and whose Magnanimity and Steadiness are equal to the glorious Cause in which He is engaged. "On this Occasion, the unfeigned Tender of our Lives and Fortunes is no more than is due to Your Majesty and our Country: And we do, from the Bottom of our Hearts, give Your Majesty the strongest Assurances, that we will zealously concur in all such Measures as may forward Year Preparations, and enable You to carry on the War with that Spirit and Vigour which truly become the British Name. "Your Majesty's Goodness, in acquainting us from the Throne, that You have augmented Your Forces by Sea and Land, pursuant to the Power given You by Parliament, with all the Moderation that was consistent with those desirable Ends, which You, in Your Royal Wisdom, have pointed out to us, is an Instance of Your Majesty's gracious Disposition to avoid bringing any unnecessary Burdens upon Your People: And though we cannot flatter ourselves that a State of War will not be attended with great Expences and some Inconveniencies; yet, when it is undertaken, not to gratify the Views of restless Ambition, but to assert and maintain the Honour and just Rights of Your Majesty's Crown and Kingdoms; we doubt not but those powerful Motives will induce all Your Subjects to undergo with Chearfulness whatever is necessary in the Prosecution of it. "It gives us inexpressible Concern, that there should be any Occasion for Your Majesty to repeat Your gracious Admonitions against those Heats and Animosities which have been fomented throughout the Kingdom: As we cannot but most seriously lament the unhappy Divisions thereby occasioned; so nothing shall be wanting on our Part to heal them, by promoting that good Harmony and Unanimity which are so necessary at this Juncture; and we trust in God, that any Hopes or Views formed by our Enemies upon such Circumstances will be found utterly vain and groundless, since all Your Majesty's Subjects must be convinced, that the Security of our Religion and Liberties and the Safety and Prosperity of these Kingdoms do entirely depend on the Preservation of Your Sacred Person and Government, and of the Protestant Succession in Your Royal House. "In this common Cause, Interest, as well as Duty, will make us unite; and we do, with the greatest Zeal and Firmness, assure Your Majesty, that we are determined, at the Hazard of all that is dear to us, to support it against all Your Enemies both at Home and Abroad; imploring the Divine Providence to give Success to Your Arms, and make them the happy Means of procuring a safe and honourable Peace." Ordered, That the said Address be presented to His Majesty by the whole House. Ordered, That the Lords with White Staves do wait on His Majesty, humbly to know what Time He will be pleased to appoint to be attended therewith. 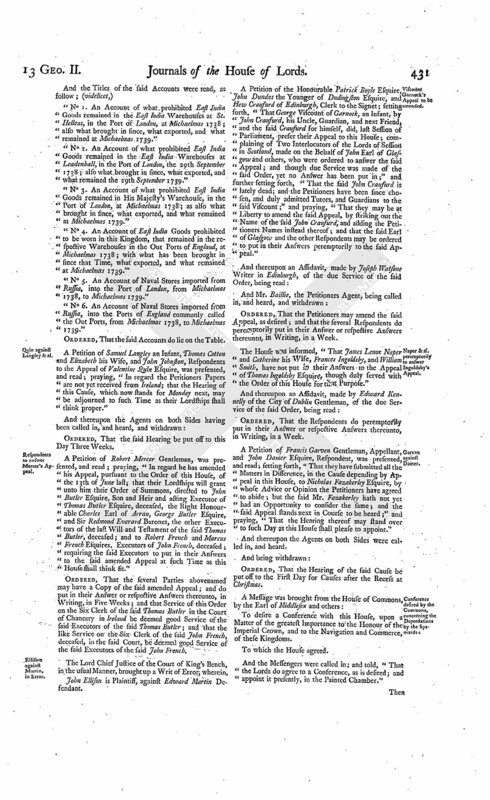 Lords Committees appointed to consider of the Customs and Orders of the House, and Privileges of Parliament, and of the Peers of Great Britain and Lords of Parliament. Vis. Torrington. L. Abp. Cant. L. B. Landaff. L. Harrington, Sec. Their Lordships, or any Seven of them; to meet on Monday next, at Ten of the Clock in the Forenoon, in the House of Peers; and every Monday after; and to adjourn as they please. 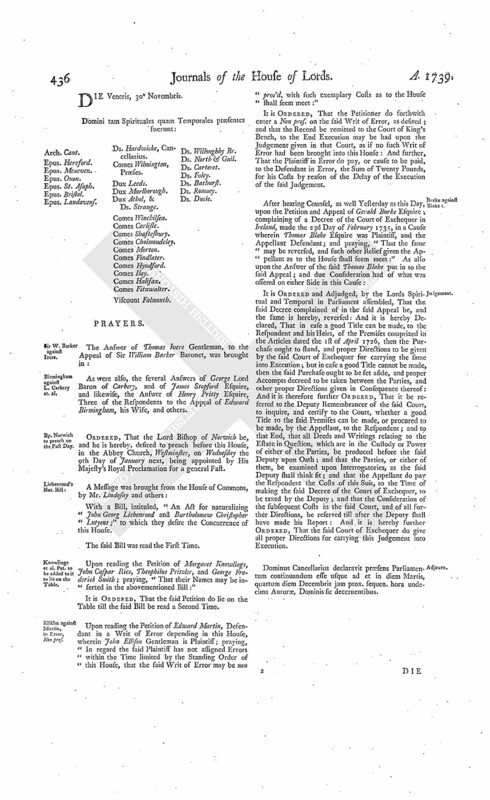 Lords Sub-committees appointed to consider of the Orders and Customs of the House, and Privileges of the Peers of Great Britain and Lords of Parliament, and to peruse and perfect the Journal of this and former Sessions of Parliament. Vis. Townshend. L. Abp. Cant. Their Lordships, or any Three of them; to meet when, where, and as often as, they please. Stoppages in the Streets, Order to prevent. The House taking Notice, "That there is such an Interruption, by Hackney Coaches, Carts, and Drays, in the Streets and Passages between Charing Cross and The Old Palace Yard in Westminster, that the Lords and others are frequently hindered from coming to this House, to the great Inconveniency of the Members of both Houses:"
It is thereupon Ordered, by the Lords Spiritual and Temporal in Parliament assembled, That the High Steward of the City of Westminster, or his Deputy, together with the Justices of the Peace for the said City, shall, by their Care and Directions to the Constables and other Officers within the said Limits, take special Order, that no empty Hackney Coaches be suffered to make any Stay, between Whitehall and The Old Palace Yard in Westminster, from Eleven of the Clock in the Forenoon until Five of the Clock in the Afternoon of the same Day, during the Sitting of this Parliament; and that no Carriages, Drays, or Carts, be permitted to pass through the said Streets and Passages, between Charing Cross and The Old Palace Yard, between the Hours aforesaid, during the Sitting of this Parliament; and herein special Care is to be taken, by the said Deputy Steward, Justices of the Peace, Constables, and all other Officers herein concerned, as the contrary will be answered to this House: And it is further Ordered, That the High Bailiff of the City of Westminster, and the Justices of the Peace for the City and Liberty thereof, or some of them residing in Westminster, be served with the Order of this House, made this Day, for the Purposes aforesaid. Dominus Cancellarius declaravit præsens Parliamentum continuandum esse usque ad et in diem Veneris, decimum sextum diem instantis Novembris, hora undecima Auroræ, Dominis sic decernentibus. His Majesty to be attended with Address. The Lord Steward acquainted the House, "That the Lords with White Staves (according to Order) had waited on His Majesty, humbly to know what Time He would be pleased to appoint to be attended with their Lordships Address; and that His Majesty had been pleased to appoint this Day, at Two a Clock, at his Palace of St. James's." Sir James Cunyngham against E. Stair & al. Upon reading the Petition and Appeal of Sir James Cunyngham, of Milncraig, Baronet; complaining of several Interlocutors of the Lords of Session in Scotland, of the 8th of June 1732, 19th of January 1732/3, 8th of June 1733, 22d of November 1734, 2d of January 1734/5, 24th of June, 22d of July, and 10th of December, 1735, 13th and 28th of February 1734/5, 27th of June and 14th of November 1735, 9th of January, 17th and 24th of February, 1735/6, 29th of July 1736, 2d of January 1734/5, 24th of June 1735, 2d of January 1734/5, 26th of November and 17th of December 1735, 28th of January 1735/6, 20th of February 1734/5, 17th of February 1735/6, 15th of June and 14th of July 1736, 27th of January, 2d and 20th of February, 1738/9, 6th of June, 10th, 27th, 28th and 31st of July, and 13th of August, 1739, made on the Behalf of Captain John Chalmer; and praying, "That the said Interlocutors, so far as complained of, may be reversed, with the many other consequential Interlocutors which have been pronounced by the said Lords in Consequence of the before recited Interlocutors; and that the Earl of Stair, the Earl of Loudoun, Colonel William Dalrymple, and the said Captain John Chalmer, may be ordered to answer the said Appeal:"
It is Ordered, That the said Parties last named may have a Copy of the said Appeal; and do put in their Answer or respective Answers thereunto, in Writing, on or before Friday the 14th Day of December next; and that Service of this Order on the said Parties, their Agents or Lawyers before the said Court of Session, be deemed good Service. Limiting Time to petition for Private Bills. Ordered, That, after the First Day of February next, this House will not receive any Petition for a Private Bill, during this Session of Parliament. Ordered, That the Cause wherein Sir George Caswall Knight and others are Appellants, and Thomas Houghton is Respondent, which, pursuant to the Standing Order of this House, stands to be heard on Monday next, be heard on the Wednesday following; and the other Causes appointed for hearing last Session of Parliament, but not then determined, to come on in Course on the next Cause-days. Dominus Cancellarius declaravit præsens Parliamentum continuandum esse usque ad et in diem Mercurii, vicesimum primum diem instantis Novembris, hora undecima Auroræ, Dominis sic decernentibus. "I thank you for this Address, so full of Duty and Affection to Me, and of seasonable Assurances of your vigorous Support. The Satisfaction you express in the Measures I have taken is very agreeable to Me; and you may depend on My Endeavours to carry on the War in such a Manner, as may best answer the necessary Ends proposed by it, and the just Expectations of My People." Accounts of prohibited East India Goods and Naval Stores delivered. The House was informed, "That some of the Commissioners of the Customs attended." "An Account of prohibited East India Goods imported and exported, from Michaelmas 1738, to Michaelmas 1739; and an Account of Naval Stores imported from Russia, for the same Time." "No 1. An Account of what prohibited East India Goods remained in the East India Warehouses at St. Hellens, in the Port of London, at Michaelmas 1738; also what brought in since, what exported, and what remained at Michaelmas 1739." "No 2. An Account of what prohibited East India Goods remained in the East India Warehouses at Leadenhall, in the Port of London, the 29th September 1738; also what brought in since, what exported, and what remained the 29th September 1739." "No 3. An Account of what prohibited East India Goods remained in His Majesty's Warehouses, in the Port of London, at Michaelmas 1738; as also what brought in since, what exported, and what remained at Michaelmas 1739." "No 4. An Account of East India Goods prohibited to be worn in this Kingdom, that remained in the respective Warehouses in the Out Ports of England, at Michaelmas 1738; with what has been brought in since that Time, what exported, and what remained at Michaelmas 1739." "No 5. An Account of Naval Stores imported from Russia, into the Port of London, from Michaelmas 1738, to Michaelmas 1739." "No 6. An Account of Naval Stores imported from Russia, into the Ports of England commonly called the Out Ports, from Michaelmas 1738, to Michaelmas 1739." Quin against Langley & al. A Petition of Samuel Langley an Infant, Thomas Cotton and Elizabeth his Wife, and John Johnston, Respondents to the Appeal of Valentine Quin Esquire, was presented, and read; praying, "In regard the Petitioners Papers are not yet received from Ireland; that the Hearing of this Cause, which now stands for Monday next, may be adjourned to such Time as their Lordships shall think proper." Ordered, That the said Hearing be put off to this Day Three Weeks. Respondents to answer Mercer's Appeal. 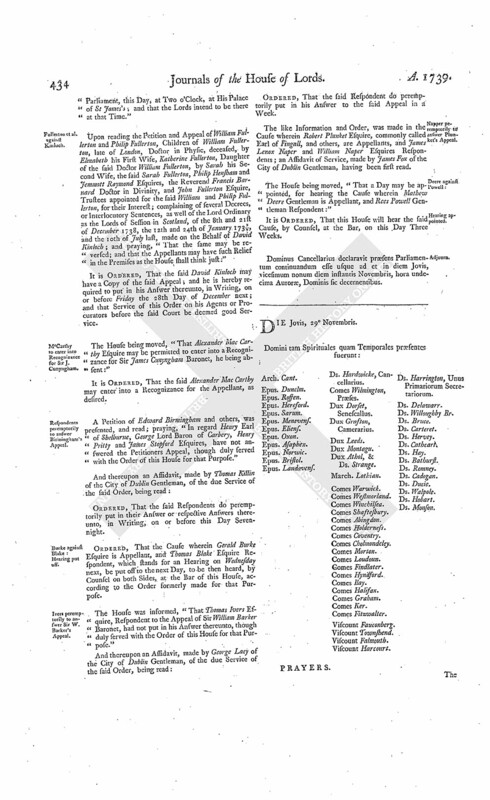 A Petition of Robert Mercer Gentleman, was presented, and read; praying, "In regard he has amended his Appeal, pursuant to the Order of this House, of the 13th of June last; that their Lordships will grant unto him their Order of Summons, directed to John Butler Esquire, Son and Heir and acting Executor of Thomas Butler Esquire, deceased, the Right Honourable Charles Earl of Arran, George Butler Esquire, and Sir Redmond Everard Baronet, the other Executors of the last Will and Testament of the said Thomas Butler, deceased; and to Robert French and Marcus French Esquires, Executors of John French, deceased; requiring the said Executors to put in their Answers to the said amended Appeal at such Time as this House shall think fit." Ordered, That the several Parties abovenamed may have a Copy of the said amended Appeal; and do put in their Answer or respective Answers thereunto, in Writing, in Five Weeks; and that Service of this Order on the Six Clerk of the said Thomas Butler in the Court of Chancery in Ireland be deemed good Service of the said Executors of the said Thomas Butler; and that the like Service on the Six Clerk of the said John French, deceased, in the said Court, be deemed good Service of the said Executors of the said John French. Ellisom against Martin, in Error. The Lord Chief Justice of the Court of King's Bench, in the usual Manner, brought up a Writ of Error; wherein, John Ellison is Plaintiff, against Edward Martin Defendant. Viscount Garnock's Appeal to be amended. A Petition of the Honourable Patrick Boyle Esquire, John Dundas the Younger of Dudingston Esquire, and Hew Craufurd of Edinburgh, Clerk to the Signet; setting forth, "That George Viscount of Garnock, an Infant, by John Craufurd, his Uncle, Guardian, and next Friend, and the said Craufurd for himself, did, last Session of Parliament, prefer their Appeal to this House; complaining of Two Interlocutors of the Lords of Session in Scotland, made on the Behalf of John Earl of Glasgow and others, who were ordered to answer the said Appeal; and though due Service was made of the said Order, yet no Answer has been put in;" and further setting forth, "That the said John Craufurd is lately dead; and the Petitioners have been since chosen, and duly admitted Tutors, and Guardians to the said Viscount;" and praying, "That they may be at Liberty to amend the said Appeal, by striking out the Name of the said John Craufurd, and adding the Petitioners Names instead thereof; and that the said Earl of Glasgow and the other Respondents may be ordered to put in their Answers peremptorily to the said Appeal." Ordered, That the Petitioners may amend the said Appeal, as desired; and that the several Respondents do peremptorily put in their Answer or respective Answers thereunto, in Writing, in a Week. Naper & al. peremptorily to answer Ingoldsby's Appeal. The House was informed, "That James Lenox Naper and Catherine his Wife, Frances Ingoldsby, and William Smith, have not put in their Answers to the Appeal of Thomas Ingoldsby Esquire, though duly served with the Order of this House for that Purpose." Ordered, That the Respondents do peremptorily put in their Answer or respective Answers thereunto, in Writing, in a Week. A Petition of Francis Garven Gentleman, Appellant, and John Damer Esquire, Respondent, was presented, and read; setting forth, "That they have submitted all the Matters in Difference, in the Cause depending by Appeal in this House, to Nicholas Fazakerley Esquire, by whose Advice or Opinion the Petitioners have agreed to abide; but the said Mr. Fazakerley hath not yet had an Opportunity to consider the same; and the said Appeal stands next in Course to be heard;" and praying, "That the Hearing thereof may stand over to such Day as this House shall please to appoint." And thereupon the Agents on both Sides were called in, and heard. Ordered, That the Hearing of the said Cause be put off to the First Day for Causes after the Recess at Christmas. To desire a Conference with this House, upon a Matter of the greatest Importance to the Honour of the Imperial Crown, and to the Navigation and Commerce, of these Kingdoms. And the Messengers were called in; and told, "That the Lords do agree to a Conference, as is desired; and appoint it presently, in the Painted Chamber." Vis. Harcourt. L. B. Rochester. L. B. Hereford. L. Willoughby Br. The House being informed, "That the Managers for the Commons were ready for the Conference, in the Painted Chamber:"
The Names of the Managers for this House were called over. And the House was adjourned during Pleasure; and the Lords went to the Conference. And the Lord President reported, "That they had met the Managers for the Commons, at the Conference; which, on their Part, was managed by Sir William Windham; who acquainted the Managers for the Lords, That, upon Consideration of a Matter of the greatest Importance to the Honour of the Imperial Crown, and to the Navigation and Commerce, of these Kingdoms, they had come to a Resolution, to be presented to His Majesty; to which they desire the Concurrence of this House." 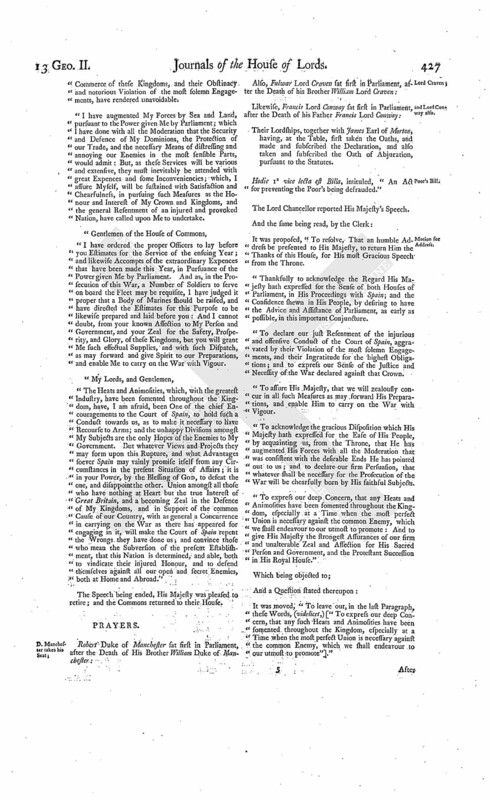 "Resolved, by the Commons in Parliament assembled, That an humble Address be presented to His Majesty, as a dutiful Return to His gracious Desire of the Advice of His Parliament, at this critical and important Conjuncture; and as a further Testimony of our firm Resolution vigorously to support His Majesty in the Prosecution of the War against Spain: Humbly to beseech His Majesty, never to admit of any Treaty of Peace with that Crown, unless the Acknowledgement of our natural and indubitable Right to navigate in the American Seas, to and from any Part of His Majesty's Dominions, without being seized, searched, visited, or stopped, under any Pretence whatsoever, shall have been first obtained as a Preliminary thereto." Then the said Resolution, being read by the Clerk, was agreed to by the House, by filling up the Blank with ["Lords Spiritual and Temporal and"]. Message to H. C. for a further Conference. Ordered, That the said Agreement be communicated to the Commons, at another Conference; and that a Message be sent to the House of Commons, by Mr. Bennet and Mr. Elde, to desire a Conference with that House, in the Painted Chamber, To-morrow, at Two o'Clock, upon the Subject-matter of the last Conference. Dominus Cancellarius declaravit præsens Parliamentum continuandum esse usque ad et in diem Jovis, vicesimum secundum diem instantis Novembris, hora undecima Auroræ, Dominis sic decernentibus. Dux Ancaster & Kesteven Magnus Camerarius Angl. Hartpole against Walsh & al. The joint and several Answer of Hunt Walsh and Philip Tench Esquires, to the Appeal of George Hartpole Esquire, was brought in. Ashworth against Chipping et al. As was also, the Answer of Richard Chipping and Elizabeth Barry, Two of the Respondents to the Appeal of Richard Ashworth. Gore et al. against Whitlaw et al. A Petition of Dame Letitia Gore, Widow of Sir Nathaniel Gore, deceased, and others, Appellants, and Alice Whitlaw and Henry Donnelly Respondents, was presented, and read; praying, "In regard neither the Appellants nor Respondents can be properly prepared in less than Five Weeks for the hearing the Cause, several material Deeds and Papers being in Ireland; that the same may be set down to be heard at such distant Time as to the House shall seem meet." Ordered, That this House will hear the said Cause, by Counsel, at the Bar, on the Second Day for Causes after the Recess at Christmas. Conference concerning the Resolution for addressing the King not to make Peace with Spain, till the Right of British Ships to navigate in the American Seas is acknowledged by the Spaniards. The Messengers sent Yesterday to the House of Commons, to desire a Conference with that House, at Two o'Clock this Day, in the Painted Chamber, on the Subject-matter of the last Conference, acquainted the House, "That the Commons do agree to a Conference, as is desired." Ordered, That the Managers of the last Conference be the Managers of this Conference. Then, the House being informed, "That the Commons were ready for the Conference, in the Painted Chamber:"
And the House was adjourned during Pleasure, and the Managers went to the Conference. And the Lord President reported, "That the Managers had met the Commons, at the Conference; and acquainted their Managers, "That this House had agreed to the Resolution delivered by them at the Conference Yesterday, by filling up the Blank with ["Lords Spiritual and Temporal and"]." Ordered, That the whole House do attend His Majesty, with the said Resolution. It is Ordered and Adjudged, by the Lords Spiritual and Temporal in Parliament assembled, That, in the said Order and Decree of the 16th of May 1737, after these Words ["taxed for the said Company by the said Deputy Remembrancer of this Court; and that"], these Words be there inserted, ["it be referred to the Deputy, to compute Interest for the Sum of £. 1600. found by the Verdict from the Time of signing the Judgement on the said Verdict to the Time of Payment thereof, under the Order of the 14th of November 1727; and that, upon Payment of what shall be so found due for Interest, at such Time and Place as the Deputy shall appoint"]: And that, in the same Order and Decree, after the Words ["on the Verdict for £. 1600. abovementioned"], these Words be inserted, ["but, in Default of such Payment, the said Original Bill, so far as it seeks to be relieved against the Proceedings at Law against the Respondent or his Bail, be dismissed, with Costs, and the Injunction already granted be dissolved"]; and that, in the Close of the said Order and Decree, these Words be left out; (videlicet,) ["and, so far as the same related to the Interest on the said £. 1600, recovered by the said Judgement"]: And it is further Ordered and Adjudged, That the said Decrees and Order complained of in the said Appeal, with these Variations, be, and the same are hereby, affirmed. Dominus Cancellarius declaravit præsens Parliamentum continuandum esse usque ad et in diem Veneris, vicesimum tertium diem instantis Novembris, hora undecima Auroræ, Dominis sic decernentibus. Comes Fitzwalter. Ds. North & Guil. The Answer of Charles McDonnell Esquire, One of the Respondents to the Appeal of William Westby Esquire, was brought in. As was also, the Answer of George Foot Gentleman, to the Appeal of Joseph Nagle Esquire. And likewise, the Answer of Robert Kean, to the Appeal of the said William Westby. His Majesty to be attended, with Address about Spain. The Earl Fitzwalter acquainted the House, "That the Lords with White Staves (according to Order) had waited on His Majesty, humbly to know what Time He would be pleased to appoint to be attended with an Address of both Houses of Parliament; and that His Majesty had been pleased to appoint this Day, at Two o'Clock, at His Palace of St. James's." To acquaint them, "That His Majesty had appointed to be attended, with an Address of both Houses of Parliament, this Day, at Two o'Clock, at His Palace of St James's; and that the Lords intend to be there at that Time." Fullerton et al. against Kinloch. Upon reading the Petition and Appeal of William Fullerton and Philip Fullerton, Children of William Fullerton, late of London, Doctor in Physic, deceased, by Elizabeth his First Wife, Katherine Fullerton, Daughter of the said Doctor William Fullerton, by Sarah his Second Wife, the said Sarah Fullerton, Philip Hensham and Jemmott Raymond Esquires, the Reverend Francis Barnard Doctor in Divinity, and John Fullerton Esquire, Trustees appointed for the said William and Philip Fullerton, for their Interest; complaining of several Decrees, or Interlocutory Sentences, as well of the Lord Ordinary as the Lords of Session in Scotland, of the 8th and 21st of December 1738, the 12th and 24th of January 1738/9, and the 10th of July last, made on the Behalf of David Kinloch; and praying, "That the same may be reversed; and that the Appellants may have such Relief in the Premises as the House shall think just:"
It is Ordered, That the said David Kinloch may have a Copy of the said Appeal; and he is hereby required to put in his Answer thereunto, in Writing, on or before Friday the 28th Day of December next; and that Service of this Order on his Agents or Procurators before the said Court be deemed good Service. McCarthy to enter into Recognizance for Sir J. Cunyngham. The House being moved, "That Alexander Mac Carthy Esquire may be permitted to enter into a Recognizance for Sir James Cunyngham Baronet, he being absent:"
It is Ordered, That the said Alexander Mac Carthy may enter into a Recognizance for the Appellant, as desired. Respondents peremptorily to answer Birmingham's Appeal. 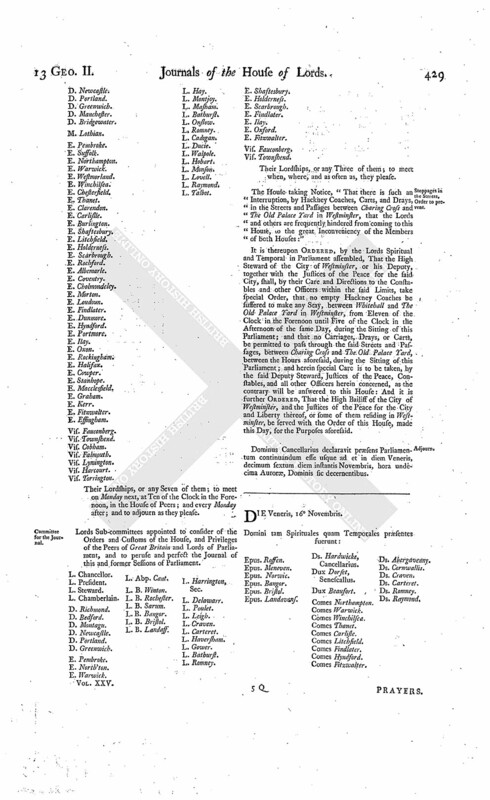 A Petition of Edward Birmingham and others, was presented, and read; praying, "In regard Henry Earl of Shelburne, George Lord Baron of Carbery, Henry Pritty and James Stopford Esquires, have not answered the Petitioners Appeal, though duly served with the Order of this House for that Purpose." Ordered, That the said Respondents do peremptorily put in their Answer or respective Answers thereunto, in Writing, on or before this Day Sevennight. Burke against Blake: Hearing put off. Ordered, That the Cause wherein Gerald Burke Esquire is Appellant, and Thomas Blake Esquire Respondent, which stands for an Hearing on Wednesday next, be put off to the next Day, to be then heard, by Counsel on both Sides, at the Bar of this House, according to the Order formerly made for that Purpose. Ivers peremptorily to answer Sir W. Barker's Appeal. The House was informed, "That Thomas Ivers Esquire, Respondent to the Appeal of Sir William Barker Baronet, had not put in his Answer thereunto, though duly served with the Order of this House for that Purpose." Ordered, That the said Respondent do peremptorily put in his Answer to the said Appeal in a Week. Napper peremptorily to answer Plunket's Appeal. 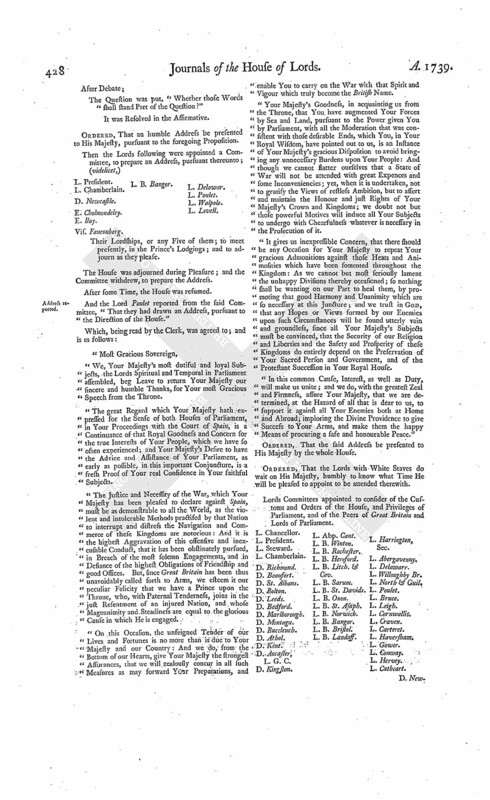 The like Information and Order, was made in the Cause wherein Robert Plunket Esquire, commonly called Earl of Fingall, and others, are Appellants, and James Lenox Naper and William Naper Esquires Respondents; an Affidavit of Service, made by James Fox of the City of Dublin Gentleman, having been first read. The House being moved, "That a Day may be appointed, for hearing the Cause wherein Mathew Deere Gentleman is Appellant, and Rees Powell Gentleman Respondent:"
It is Ordered, That this House will hear the said Cause, by Counsel, at the Bar, on this Day Three Weeks. Dominus Cancellarius declaravit præsens Parliamentum continuandum esse usque ad et in diem Jovis, vicesimum nonum diem instantis Novembris, hora undecima Auroræ, Dominis sic decernentibus. His Majesty's Answer to Resolution concerning Spain, to be printed. "I thank you for this dutiful Address, which is so agreeable to former Resolutions of both Houses of Parliament. Your unanimous and vigorous Support in carrying on the War will be the best Means of procuring safe and honourable Terms of Peace: And you may rely on My utmost Care and Endeavour to obtain effectual Security for the just Rights of Navigation and Commerce belonging to My Subjects." Ordered, That the said Resolution, and His Majesty's most Gracious Answer thereunto, be forthwith printed and published. Visc. Arthburtnot & al. against Spotswood. 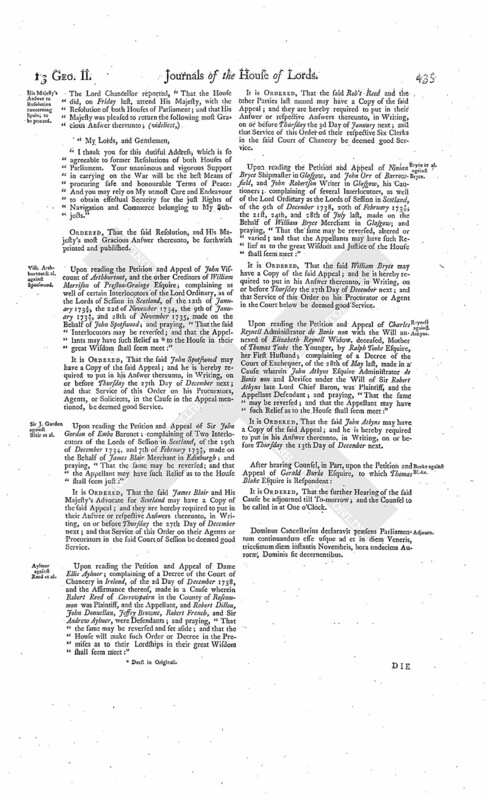 Upon reading the Petition and Appeal of John Viscount of Arthburtnot, and the other Creditors of William Morrison of Preston-Grainge Esquire; complaining as well of certain Interlocutors of the Lord Ordinary, as of the Lords of Session in Scotland, of the 12th of January 1733/4, the 22d of November 1734, the 9th of January 1734/5, and 28th of November 1735, made on the Behalf of John Spotswood; and praying, "That the said Interlocutors may be reversed; and that the Appellants may have such Relief as (fn. 1) to the House in their great Wisdom shall seem meet:"
It is Ordered, That the said John Spotswood may have a Copy of the said Appeal; and he is hereby required to put in his Answer thereunto, in Writing, on or before Thursday the 27th Day of December next; and that Service of this Order on his Procurators, Agents, or Solicitors, in the Cause in the Appeal mentioned, be deemed good Service. Sir J. Gordon against Blair et al. Upon reading the Petition and Appeal of Sir John Gordon of Embo Baronet; complaining of Two Interlocutors of the Lords of Session in Scotland, of the 19th of December 1734, and 7th of February 1734/5, made on the Behalf of James Blair Merchant in Edinburgh; and praying, "That the same may be reversed; and that the Appellant may have such Relief as to the House shall seem just:"
It is Ordered, That the said James Blair and His Majesty's Advocate for Scotland may have a Copy of the said Appeal; and they are hereby required to put in their Answer or respective Answers thereunto, in Writing, on or before Thursday the 27th Day of December next; and that Service of this Order on their Agents or Procurators in the said Court of Session be deemed good Service. Aylmer against Reed et al. 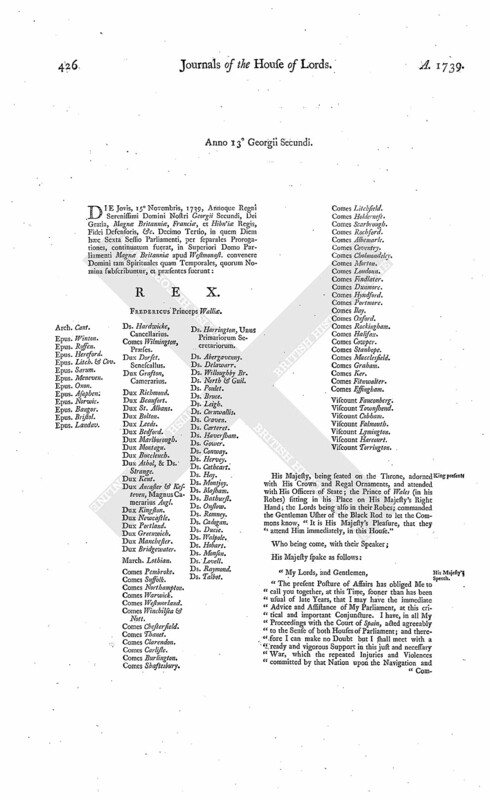 Upon reading the Petition and Appeal of Dame Ellis Aylmer; complaining of a Decree of the Court of Chancery in Ireland, of the 2d Day of December 1738, and the Affirmance thereof, made in a Cause wherein Robert Reed of Carrowpairn in the County of Roscommon was Plaintiff, and the Appellant, and Robert Dillon, John Donnellan, Jeffry Browne, Robert French, and Sir Andrew Aylmer, were Defendants; and praying, "That the same may be reversed and set aside; and that the House will make such Order or Decree in the Premises as to their Lordships in their great Wisdom shall seem meet:"
It is Ordered, That the said Rob't Reed and the other Parties last named may have a Copy of the said Appeal; and they are hereby required to put in their Answer or respective Answers thereunto, in Writing, on or before Thursday the 3d Day of January next; and that Service of this Order on their respective Six Clerks in the said Court of Chancery be deemed good Service. Bryce et al. against Bryce. 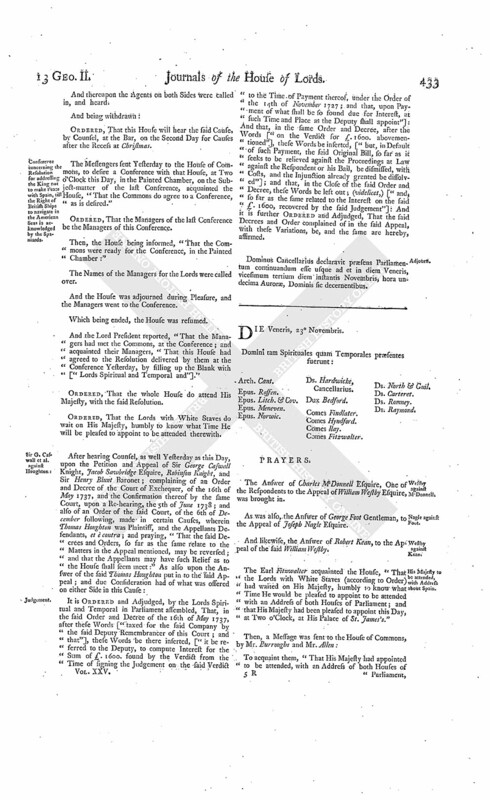 Upon reading the Petition and Appeal of Ninian Bryce Shipmaster in Glasgow, and John Orr of Barrowfield, and John Robertson Writer in Glasgow, his Cautioners; complaining of several Interlocutors, as well of the Lord Ordinary as the Lords of Session in Scotland, of the 9th of December 1738, 20th of February 1738/9, the 21st, 24th, and 28th of July last, made on the Behalf of William Bryce Merchant in Glasgow; and praying, "That the same may be reversed, altered or varied; and that the Appellants may have such Relief as to the great Wisdom and Justice of the House shall seem meet:"
It is Ordered, That the said William Bryce may have a Copy of the said Appeal; and he is hereby required to put in his Answer thereunto, in Writing, on or before Thursday the 27th Day of December next; and that Service of this Order on his Procurator or Agent in the Court below be deemed good Service. Upon reading the Petition and Appeal of Charles Reynell Administrator de Bonis non with the Will annexed of Elizabeth Reynell Widow, deceased, Mother of Thomas Tooke the Younger, by Ralph Tooke Esquire, her First Husband; complaining of a Decree of the Court of Exchequer, of the 28th of May last, made in a Cause wherein John Atkyns Esquire Administrator de Bonis non and Devisee under the Will of Sir Robert Atkyns late Lord Chief Baron, was Plaintiff, and the Appellant Defendant; and praying, "That the same may be reversed; and that the Appellant may have such Relief as to the House shall seem meet:"
It is Ordered, That the said John Atkyns may have a Copy of the said Appeal; and he is hereby required to put in his Answer thereunto, in Writing, on or before Thursday the 13th Day of December next. It is Ordered, That the further Hearing of the said Cause be adjourned till To-morrow; and the Counsel to be called in at One o'Clock. Dominus Cancellarius declaravit præsens Parliamentum continuandum esse usque ad et in diem Veneris, tricesimum diem instantis Novembris, hora undecima Auroræ Dominis sic decernentibus. Viscount Falmouth. Ds. Willoughby Br. Sir W. Barker against Ivers. Birmingham against L. Carbery et. al. As were also, the several Answers of George Lord Baron of Carbery, and of James Stopford Esquire, and likewise, the Answer of Henry Pritty Esquire, Three of the Respondents to the Appeal of Edward Birmingham, his Wife, and others. Bp. Norwich to preach on the Fast Day. Ordered, That the Lord Bishop of Norwich be, and he is hereby, desired to preach before this House, in the Abbey Church, Westminster, on Wednesday the 9th Day of January next, being appointed by His Majesty's Royal Proclamation for a general Fast. With a Bill, intituled, "An Act for naturalizing John Georg Liebenrood and Bartholomew Christopher Lutyens;" to which they desire the Concurrence of this House. Knowlings et al. Pet. to be added to it to lie on the Table. Upon reading the Petition of Margaret Knowlings, John Caspar Ries, Theophilus Pritzler, and George Frederick Smith; praying, "That their Names may be inserted in the abovementioned Bill:"
Ellison against Martin, in Error, Non pros. Upon reading the Petition of Edward Martin, Defendant in a Writ of Error depending in this House, wherein John Ellison Gentleman is Plaintiff; praying, "In regard the said Plaintiff has not assigned Errors within the Time limited by the Standing Order of this House, that the said Writ of Error may be non pros'd, with such exemplary Costs as to the House shall seem meet:"
It is Ordered, That the Petitioner do forthwith enter a Non pros. on the said Writ of Error, as desired; and that the Record be remitted to the Court of King's Bench, to the End Execution may be had upon the Judgement given in that Court, as if no such Writ of Error had been brought into this House: And further, That the Plaintiff in Error do pay, or cause to be paid, to the Defendant in Error, the Sum of Twenty Pounds, for his Costs by reason of the Delay of the Execution of the said Judgement. 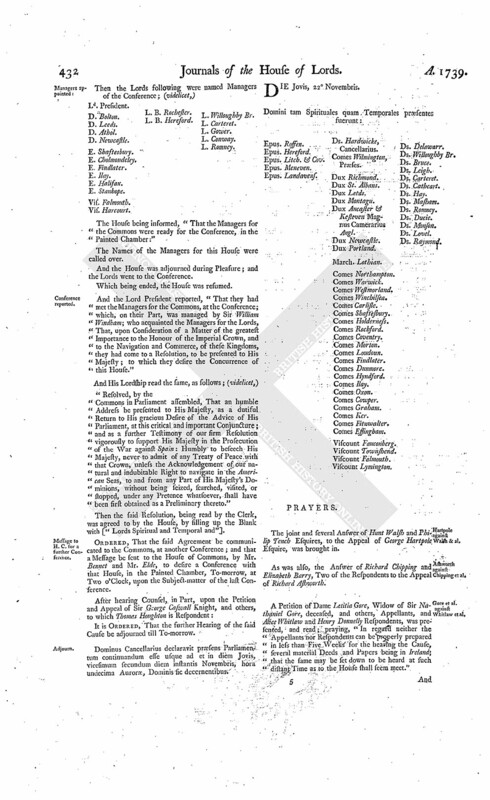 It is Ordered and Adjudged, by the Lords Spiritual and Temporal in Parliament assembled, That the said Decree complained of in the said Appeal be, and the same is hereby, reversed: And it is hereby Declared, That in case a good Title can be made, to the Respondent and his Heirs, of the Premises comprized in the Articles dated the 1st of April 1726, then the Purchase ought to stand, and proper Directions to be given by the said Court of Exchequer for carrying the same into Execution; but in case a good Title cannot be made, then the said Purchase ought to be set aside, and proper Accompts decreed to be taken between the Parties, and other proper Directions given in Consequence thereof: And it is therefore further Ordered, That it be referred to the Deputy Remembrancer of the said Court, to inquire, and certify to the Court, whether a good Title to the said Premises can be made, or procured to be made, by the Appellant, to the Respondent; and to that End, that all Deeds and Writings relating to the Estate in Question, which are in the Custody or Power of either of the Parties, be produced before the said Deputy upon Oath; and that the Parties, or either of them, be examined upon Interrogatories, as the said Deputy shall think fit; and that the Appellant do pay the Respondent the Costs of this Suit, to the Time of making the said Decree of the Court of Exchequer, to be taxed by the Deputy; and that the Consideration of the subsequent Costs in the said Court, and of all further Directions, be reserved till after the Deputy shall have made his Report: And it is hereby further Ordered, That the said Court of Exchequer do give all proper Directions for carrying this Judgement into Execution. Dominus Cancellarius declaravit præsens Parliamentum continuandum esse usque ad et in diem Martis, quartum diem Decembris jam prox. sequen. hora undecima Auroræ, Dominis sic decernentibus.